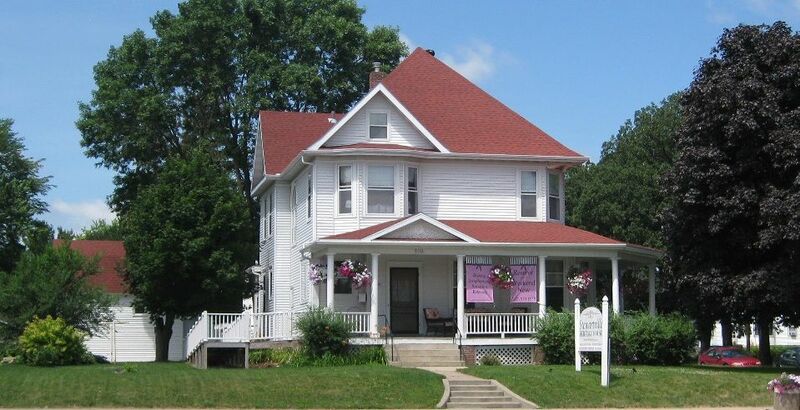 Beautiful 1901 Victorian - 15 minutes to Mayo Clinic! Enjoy simple, quiet living in a beautiful 1901 Victorian with original details. We are the only licensed guest house in Olmsted County and are very proud that we have exceeded expectations on every annual review. You can be assured that we will provide a professional level of comfort, quality, safety and service during your stay. Stay in our Stewartville community or take an easy drive to Rochester, Minnesota, home of The Mayo Clinic. We are close to the Rochester International Airport, I-90, HWY 52, and HWY 30. House favorites include the turrets, the grand staircase, a stained glass window, the dumbwaiter, the ornate radiators (hot water heat), and the airy porch. We have updated for luxury and comfort - including air condition. The kitchen is new. It includes every convenience to make your stay effortless – stainless steel sink, refrigerator, stove, microwave, NSF approved dishwasher. Blender, coffee pot, and toaster are also included. The butler’s pantry has delightful dishware, pots and pans, beverage center. The dining table seats 8-10. There are 3 bedrooms. We can sleep 9. Beds include 2 queens, 3 twin daybeds, and 2 twin beds. Walk/Bike to local parks and enjoy family-owned restaurants and pubs. Car Service can be arranged. Fresh towels are provided. Complimentary shampoo, conditioner, soap, make up remover wipe, and body lotion are provided. Children: We love children! Please let us know if they will be visiting. We will make the rooms friendly to children. Special Requests: With enough notice of your special requests, we can help you arrange gym time, maid service, and chauffer. Additional fees will apply. We can also provide bottled water, hair dryer, etc. Please let us know what you may have forgotten. Special events:We know the area very well. We can help you find great restaurants and special events happening in our area. Enjoyed the roominess. Was well stocked with whatever you’d need. The only improvement would be maintenance on the bicycles, they were a bit wobbly. Love the hammock and porch and patio furniture. Thanks for a lovely place for a family vacation. Beautifully restored and spacious! We invited our family to join us here for the weekend and it was definitely a pleasure! It was immaculate and well appointed with everything we needed to enjoy the weekend. A beautiful home in a quaint little town on the Root River. Thank you, Todd! We enjoyed having your family so much! We are honored you used the house for such an important family celebration! Best Wishes!